My daughter is always losing her things,specifically her headbands,she has quite a few of them,and she often gets annoyed that she can't find the right one for that particular day. 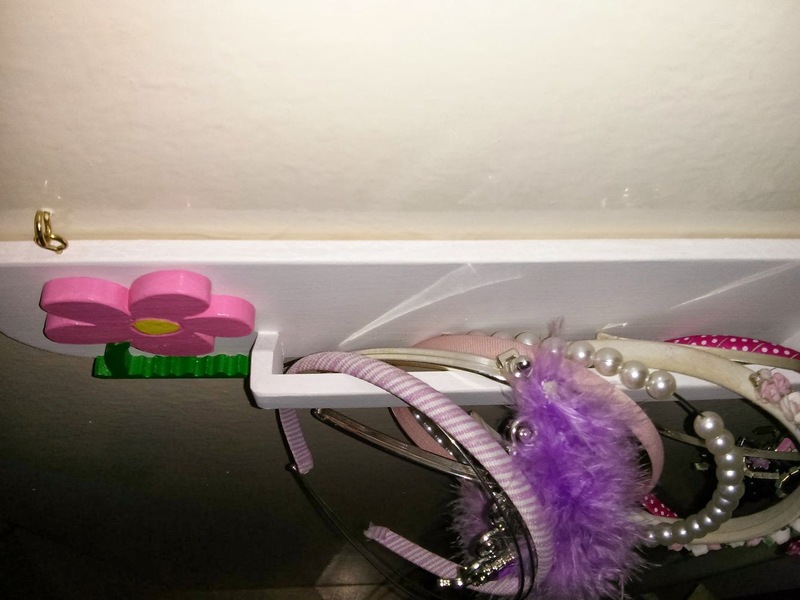 I always say to her that she should put them some where in her room,where she'll be able to find them again,but she doesn't always remember,so I made her a place for her headbands to live when they aren't on her head. I did look online at various headband holder type things,they mostly seemed to be made from round things,like cardboard tubes,and I didn't have anything that would do,so I made this,it's basically a bit of wood with a rail on it that she can hook the headbands onto. 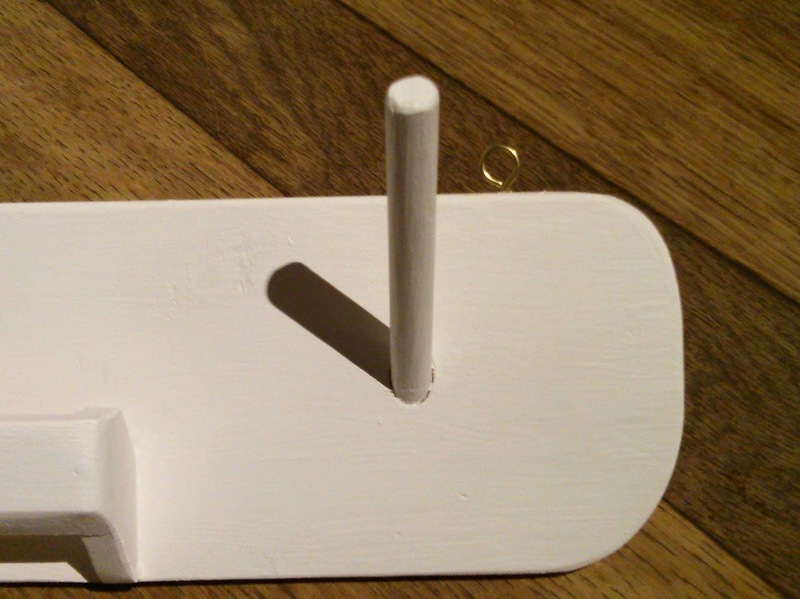 I also put a peg on so that she can hang her necklaces and bracelets on,as she often loses those as well (despite having numerous jewellery boxes) It's all made from a piece of match board (thin tongue and groove) apart from the peg,that's just a bit of 9mm dowel. 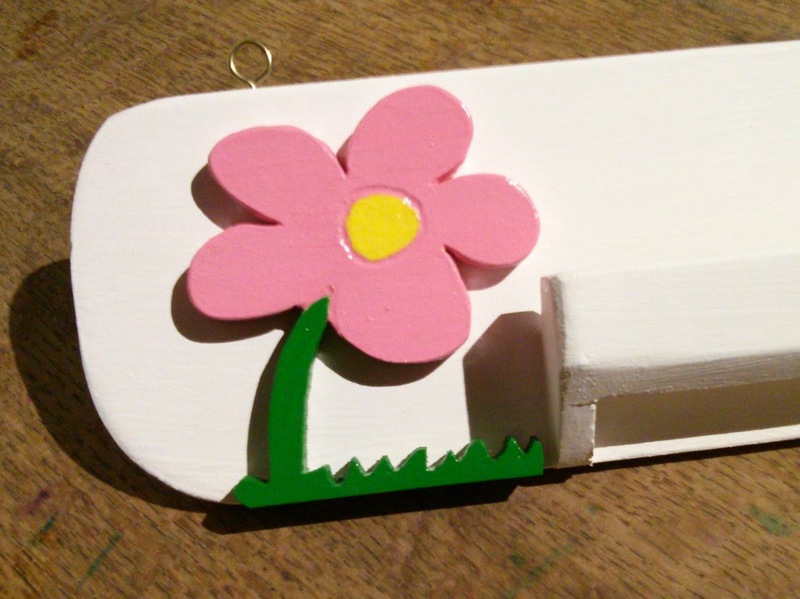 The flower was cut from a scrap bit of wood,and then I painted it to make it look a little nicer,and it adds a bit of colour to the whole thing,once the paint was dry I stuck it to the holder with a bit of glue. The peg was also glued into place,I drilled a hole into the wood at and angle so the peg will point upwards,this helps stop things from sliding off. Just enough room for a few trinkets. The part that holds the headbands is made by sticking a couple of small squares of wood to a thin strip,which creates a kind of 'c' shape this is then fixed with of a few small nails and a bit of glue to the holder. Here's a picture that shows how the rail sits away from the back board to create a gap that the ends of the headbands can fit into. To hang the holder on the door I used four small hooks,two I fixed into the holder at each end,the other two I fixed into the door where the holder now hangs,it's light and doesn't need strong fixings. It works,and it's out of the way,so it shouldn't get knocked. The whole thing cost no more than about £2, and now my daughter knows where her headbands are when she needs them.